Even the most diligent housekeepers will find crazy food buildup inside the oven over time. Many people don’t prefer to use the self-cleaning feature because it stinks up the house and can even cause damage to your oven. We propose trying a natural oven cleaner that is simple, effective, and gets the job done without the stench. A good, natural oven cleaner and a little muscle will spare you nasty chemical fumes and keep your home from smelling like an incinerator. Natural oven cleaners are gentler on your skin, lungs, and are still effective enough to give your oven a makeover. 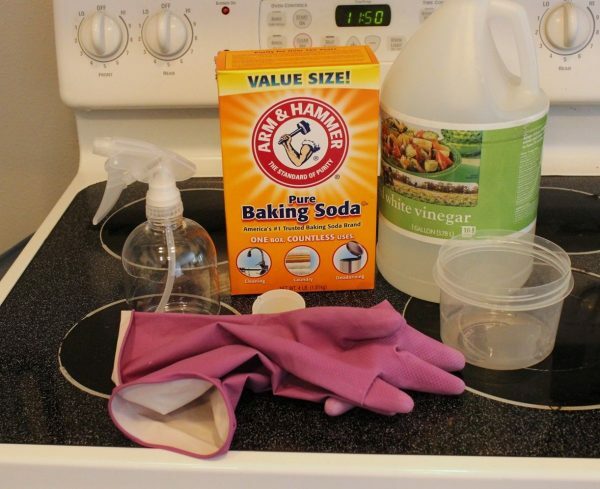 You can make your own homemade oven cleaner with this easy DIY oven cleaner recipe below. So open your pantry cupboards, grab some supplies, and get to work! It’s pretty magical to put oven items into the bathtub and have plenty of room to wash everything and rinse it off without water getting all over the kitchen counters and floors. It’s also the only place large enough to soak the racks first, which makes the washing task that much easier. If you have a small dust broom, sweep out the loose debris from the oven. You can also use your vacuum hose attachment if your vacuum can handle it. Adjust amounts if needed to achieve desired consistency. Don your rubber gloves and spread the baking soda paste all over the interior of the oven, being careful to avoid the heating elements. Make sure you have a good coat of paste on all the grimy parts. The gloves are handy for really rubbing in the paste. You will notice the baking soda turns a brownish color. This may indeed be the best part – walk away and let the paste work its magic while you go about your business, have a cup of coffee, take a nap… 12 hours (or more) is ideal. At some point while your natural oven cleaner is sitting, get the racks cleaned up. Whether they’re in your sink or tub, some regular dish soap and scrubbing sponge should do the trick. Rinse well and set aside to dry. Using a damp cloth and plastic scraper, wipe out the dried paste and debris. Scrape any stubborn areas and wipe them again. With some vinegar in a spray bottle, carefully spray the inside of the oven, avoiding the heating elements. The vinegar will foam upon contact with the residual baking soda from the natural oven cleaner. Scrape any left over stuck on spots – they should come loose more easily now. With a fresh damp cloth, wipe down the entire interior of the oven to remove all remaining particles. Your oven is clean and ready for action! Regular cleaning maintenance of home appliances will keep them performing for years to come. If you have appliances that need service or repair, contact our professionals at Service Care today. Can You Wash a Rug in the Washing Machine? FAQ: Can I Use Regular Detergent in a HE Washer?